The macula is found at the center in the back of the retina and helps with the central vision which is responsible for reading, recognizing a face or driving. It is made of rods and cones which are photoreceptor cells, and just next to these cells we find another set of cells called retinal pigment epithelium that nourish the rods and cones and take away any wastes produced. In macular degeneration, the retinal pigment epithelium cells (RPE) stop working and the photoreceptor cells die leading to blurred sharp central vision. Macular degeneration is related to age; millions of people at the age of 50 years and above are said to be more vulnerable to the condition. According to a report released by Center for Disease Control (CDC), about 2.9 million adults in the US have suffered this condition. Studies show that people above the age of 60 years are more vulnerable than those who are middle aged. Women have a higher risk of macular degeneration than men. Some genes have an association with the disease hence people with such genes are more prone to the condition. People who smoke are found to be at higher risk of the disease than those who do not. More exposure to UV radiation could increase the risk of macular degeneration. 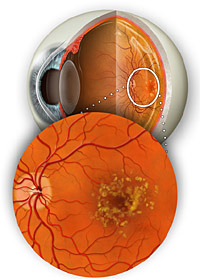 Some diets and poor nutrition could lead to the development of macular degeneration. • One of the earliest signs of macular degeneration is a distortion of straight lines which may progress to loss of vision. • Inability to read the small print even with reading glasses on. • Blurred and unclear vision especially in the center of the vision. • Difficulty in color perception. Abnormal vessels develop near the macula; these vessels are weak hence they leak the blood and fluids in the region around them. This leakage tends to disposition the macula and the central vision becomes blurry and the person can lose his/her sight in a matter of weeks or days. This is the most common, the RPE layer is seen to be thinning (RPE is responsible for nourishment and taking away wastes of the photoreceptors cells). With the loss of the supporting cells, the rods and cones eventually become damaged leading to loss of vision. For the wet macular degeneration, the most common symptom is the distortion of a straight line when we look at it, due to the build-up of fluid from the abnormal vessels hence lifting the macula. In the case of dry macular degeneration, there is an appearance of drusen (which is a fatty protein and could be waste product due to the dead photoreceptor cells). Drusens are white or yellow in color, they come in different types and have different levels of risk. 3. Tonometry which measures the pressure in the eye. How is macular degeneration stem cell therapy helpful? Over the years a surgical procedure was the only way to treat macular degeneration until stem cells were discovered. Stem cells are not specific to their purpose, hence they can be induced to become cells of different organs and this regenerative property in the stem cells is used to treat macular degeneration. In macular degeneration, there are two cell types that die; Retinal Pigment Epithelial cells (RPE) and Photoreceptors) and it has been established that it is easier to get stem cells to act as RPE than photoreceptors. The RPE cells are located in a single layer where they perform their supportive duties to the photoreceptors. Photoreceptors are dependent on the RPE cells and hence with the absence of RPE cells, the photoreceptors cells die, as seen in the dry macular degeneration. Stem cells can be “trained” to be RPE cells; they are injected in the selected target area and immediately get to work improving symptoms for the patient. Macular degeneration stem cell therapy has been successful in helping hundreds of patients with their AMD. We conduct the treatment step-by-step making the success a sure thing. The stem cells reach the target area with our methods easily and replace the damaged tissue. Would you like Treatment for Macular Degeneration?